In our Bay Area therapy practice, clients often ask why they need to discuss what happened in their early years. You may wonder the same. How will dwelling on the past help you move forward with your problems today? 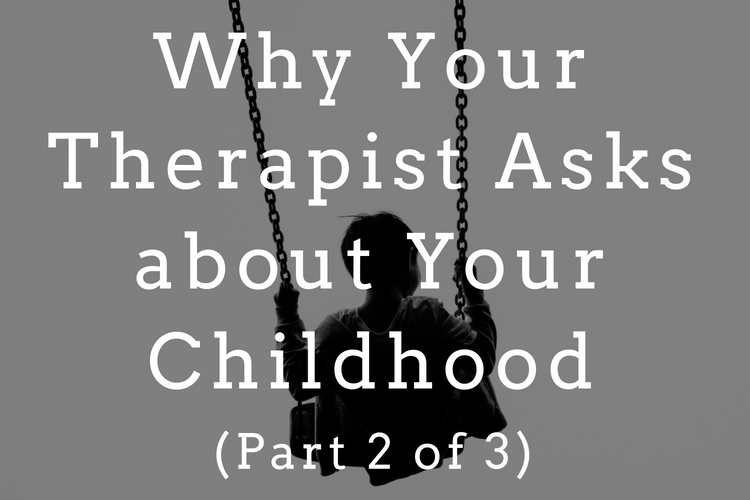 In Part 1 of this three-part series, we explained the reasons why most therapists ask about your childhood. Talking about your childhood sheds light on how you developed your view of the world and of yourself. It’s when you learned about emotions. Though you may not see it at first, your childhood directly informs what you’re feeling and experiencing today. However, talking about childhood isn’t easy for everyone. You may feel resistance to the process. Today, in Part 2, we’ll look at why. Talking about your childhood necessarily involves talking about a time when you didn’t have a lot of control over what was happening or what others were doing. The conversation requires you to revisit those difficult feelings from the past when you felt alone, afraid, or helpless. As an adult, you’ve developed a thick skin and shrug those things off. You worry that going back to those places will undo you. But you’re still a child on the inside; each of us is. And your armor is actually more like an eggshell. Talking about your childhood in therapy will be like cracking that eggshell to reveal your true self. You don’t do it all at once. You go slowly and pry away a piece at a time. You are protective of your family and don’t want to say anything bad about them. You don’t want your therapist to judge them, to think they were bad parents or didn’t love you. There may be strong cultural taboos against “airing your dirty laundry” or telling the family secrets, beliefs which are related to shame. There is something deep about “our tribe” and about where we come from. We are pack animals that need others around us to survive, and breaking the taboo of talking about hard stuff can feel like a betrayal of your family. It may be painful to hear your therapist’s reaction because you have spent a lot of time telling yourself it was no big deal. Yet your five-year-old hears it when your therapist affirms that something was bad, painful, traumatic or a boundary violation. Your parents were doing the best they could with what they knew and who they were. This isn’t a platitude; it’s true. Hurt people hurt people. And your parents were children once, too, and learned about life, trust, safety and love from whoever raised them. The same is true of your grandparents. You can trace this back for generations. Additionally, families don’t exist in vacuums. There is always the influence of cultural and political factors that shaped what you learned growing up. Talking about your childhood can bring up so many conflicting emotions—shame, hurt, sadness, embarrassment, anger, confusion, and protectiveness. All of that can feel overwhelming. Experiencing all these emotions can feel like too much. That’s why talking about them, and feeling your feelings in therapy, will help you feel less alone. Talking will help you “bite-size” these feelings so you don’t have to feel everything hard at once. Thinking that dwelling will make things worse. You may worry that going back to those places in childhood will undo you; that once you start thinking about it, you will never get out of the pain and hurt from the past. You may think it’s better to let bygones be bygones. This kind of thinking is a form of invalidation. Somewhere you got the message, directly or indirectly, that what you were feeling was wrong, bad, or that you shouldn’t feel what you feel. When your therapist reflects back, they essentially validate your emotions—the ones you’ve tried to cancel out or ignore. This validation can feel relieving, but also overwhelming. The emotional floodgates open and you worry they won’t close again. You may say, “If I start crying, I’ll never stop.” This is a common fear. And yet, sometimes in therapy, you have to feel worse before you feel better. “What?” you may wonder. “But I came to therapy to feel better.” And you will. But first, you may have to walk through an emotional fire before you can get some relief. To feel better, you have to go through what is hard, rather than get over it or blithely put it behind you. Ignoring a problem never works. People don’t just get over things. We go through or work through our issues, and at the end, we are changed. Willing yourself to not think about things or not feel emotions does not make them go away. In therapy, you won’t be dwelling. The point is not to continually lick those old wounds, but to open them up, clean out the infection, and allow them to heal properly and slowly in the natural course of healing. You can’t rush it. “Airing the dirty laundry”—this phrase is meant to stop people from speaking about things that evoke shame. Maybe you feel ashamed of your family or ashamed of your own behavior. Or perhaps you feel toxic shame. Toxic shame is shame that makes you feel that you are bad as a human being, that who you are is not OK. These feelings are common in particular in families with emotional, physical or sexual abuse. You don’t remember anything from your childhood. Generally, we begin forming memories around age three. Often when you can’t remember your childhood there is some kind of trauma or neglect, but not always. Some research indicates that a lack of childhood memories may reflect a lack of attention; if your days and years were similar with no major changes, the childhood memories may run together and be indistinct. However, for some people, childhood memory loss is about trauma or pain. Sometimes, to block things out, our brain shuts hard memories off into a box. This is a way of protecting yourself when you’re young and it helps with resilience. Unfortunately, when we do this, we can lose part of ourselves. I’ve already talked about my past. If you feel impatient to “get on with it,” this last reason may apply to you. What we tell our clients is that there is wisdom in revisiting your childhood, even if you’ve been in therapy before and have talked about it and feel like you worked through a lot. Different phases of life bring up different things. As you get older and have different life experiences, both positive and negative, new memories and feelings will emerge. For example, if you are a new parent, or are facing the loss of a parent or death or illness in yourself or someone you care about, these experiences may stir up recollections from your early life. New life experiences have a way of stirring up and touching on the past. They call for you to revisit some stories of your past, or to look at things in a new light. They require a shift in the narration of the story, because you, the narrator, have changed. For example, anger at your parents when young may soften as you age and gain more perspective; or conversely, anger may intensify as you age and feel more entitled to your feelings. We are always changing, which is why therapy, and talking about your childhood, in particular, is not a “one and done” process. It keeps growing and evolving, just as you do. In the next and final post in this three-part series, we’ll discuss the “payoff” of this process: how talking about your childhood will help you grow, heal, and transform. Contact us at 415-310-5142. Our offices are located in the Castro district of San Francisco.